The Siberia: Joining the Dots team – journalist Anna Gruzdeva, photographer and Buddhist lama Daba Dabayev and photo reporter Anton Petrov –spent two summers in the Altai. They wanted to find out more about the daily life of modern Altai nomads and earn their trust. Photo credit: Anton Petrov On a hot day, the Chuya Steppe in the south of Altai can resemble the prairies of Arizona: A perfectly even highway across a yellow wasteland populated by the occasional dry bush or insects. In the summer heat, these ocher-colored sceneries turn into a moving impressionist painting: The only still landmarks are the Chikhachev Range, distant and bluish and the one thing separating us from the Republic of Tuva, and the snowy Severo-Chuysky Range, which obscures Mongolia. There is little chance that you will encounter a random tourist here. 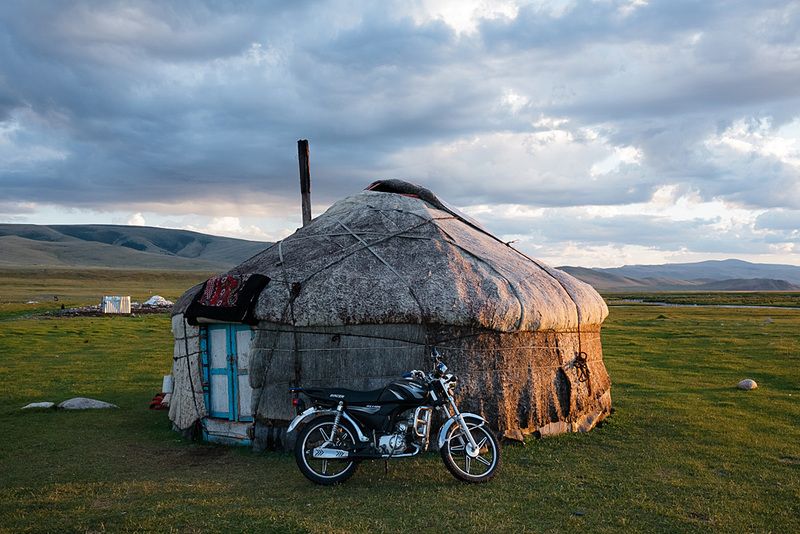 The Kosh-Agach district of the Altai Republic attracts adventurers and photographers, ethnographers and archaeologists, hitchhikers and bikers – everyone who longs for a true immersion into the exotic life of the steppe. For the second year in a row, we meet these "purposeful" people in the yurt campground Tyd-Tuyaryk, located at kilometer 871 of the Chuysky Trakt. Every day brings another shared experience: Listening to an evening concert of kaichi, the Altai storytellers, by the fire or eating local cheese for breakfast in the guest yurt. Eventually we all take off, each of us following their own route through the region. During our first trip to Altai, we visited shepherds and nomads in the valley of the Yustyd River, situated on the Russian-Mongolian border. For us city dwellers, every day of their steppe life, which is busy with herding sheep, goats, horses, yaks and cows, washing clothes, cleaning and cooking food, was imprinted forever in our minds. We soon became friends. The evening skies above the Yustyd Valley are clear and full of stars, with the white peaks of the Chikhachev Range shimmering in the distance. It rained the day before; frost set in and snow covered the mountains. By 10 in the evening, some of the shepherds had already gone to their family yurts, so the quiet babble of the river was all you could hear for miles around. Ayzhanat Asanova, a Kazakh woman whose family lived nearby, wanted to treat our crew to some homemade kurt – a cheese that the Kazakhs call "rynchik" – and invited me in for a visit. The yurt was feebly lit, the only source of light being a small stove in the middle of the room. All of Ayzhanat's children, except for Zhansaya, her eldest daughter, were asleep, and her quiet husband, Serikbol, was outside, untying horses so that they could pasture in the valley during the night. Ayzhanat didn't speak good Russian, but she managed to tell us something about her family's nomadic life. The Asanovs live in a yurt all year round, changing camps and pastures. Most of the time I was there, she was patiently boiling cow milk in a big aluminum pot on the stove – our future cheese. A few hours later, her daughter helped her to sift the milk through a piece of clean buttercloth, add the cultures and place the mixture in a dark place. The yurt filled up with our shared fatigue, silence and a warm milky smell. Serikbol returned and fell asleep. As I was leaving the cozy yurt for our chilly tent, I felt a little uncomfortable. I knew Ayzhanat would get up at five in the morning to milk the cows and it would still take her a while to finish making the cheese. But she just smiled and wished me good night. In the morning, Zhansaya and the other children brought us a big, white, soft and delicious hunk of homemade cheese, wrapped in buttercloth. This cheese filled our stomachs over the course of many more breakfasts, lunches and dinners during our Altai trip. After we returned home last fall, I sent a few prints of our summer photos to the Asanovs. They were happy to receive them. I also communicated with their children on social media. I asked how their family was and what the weather was like. "We are in the settlement, at school,” they wrote. “Our parents are in the camp; it's around 40 below Celsius." We sent them a text in spring to let them know we’d be coming again. This summer, I left Yustyd with a hunk of cheese and an understanding that although Siberia is vast, Altai is not a foreign land to me anymore.